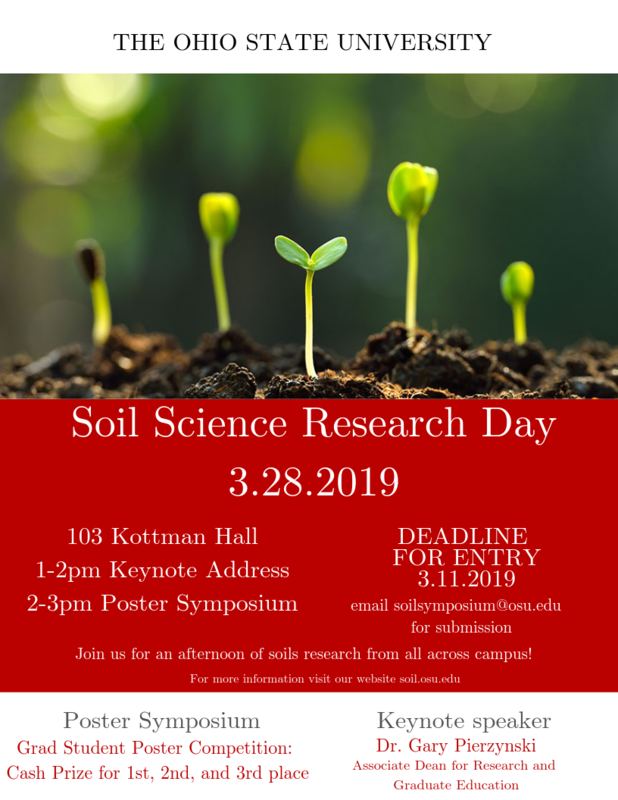 You are invited to attend the inaugural Ohio State Soil Science Research Day on Thursday, March 28th, 2019. The research day will consist of a keynote address from Dr. Gary Pierzynski at 1 pm in 103 Kottman Hall followed by a poster symposium. The goal of the Soil Science Research Day is to promote soil science across all disciplines and to increase awareness of its importance to the environment, society, and economy. The poster symposium will feature research from students, post-docs, and faculty from across the University. There will be a grad student poster competition with cash prizes for 1st, 2nd, and 3rd place as part of the symposium. The initiative and the organizing committee originated out of the Soil Science Seminar at the School of Environmental and Natural Resources; the group is composed of graduate students, researchers and faculty. Please address any questions you may have about the event to the Soil Seminar Organizing committee at: Soilsymposium@osu.edu.